Brand Journal #7: Brand Survey – m.o.c.h.a. Why did you think of this brand? First competitor brand you can think of? There were three sets of questions in total with the brand categories being technology, fashion, and happiness. Since I was sending this out to normal people who would approach this task with a consumer mindset, I chose the two product categories, technology and fashion, that have high demand and heavily branded goods. I also chose happiness as a category because it would be enlightening to see if certain brand values or messages are effectively communicated to consumers and if different consumers had varying perspectives of the brand values. The results for the first set of questions regarding technology met my expectations. As I wrote the question, I immediately thought of Google and then Apple for technology. This is due in part to both companies’ prominence in the consumer market as leading technology innovators in mobile, computer, and tablet devices as well as other consumer goods. I assumed the majority of people surveyed would answer with Apple for the first question because so many people, young adults in particular, use their products. The most valuable information from the survey comes from the section asking respondents to describe the brand in three words. This reveals the positioning of the brand in each consumer’s mind, which is not necessarily the positioning in the entire market. 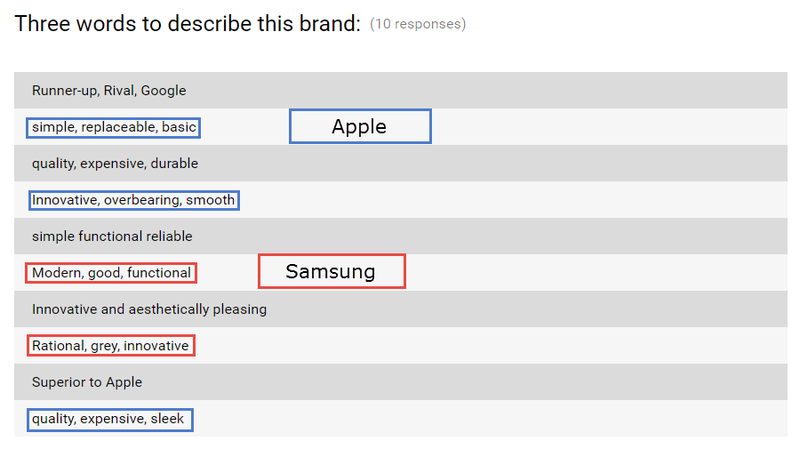 Samsung has a practical and innovative positioning with a few words being “rational,” “modern,” “functional,” and “superior.” Apple has a very contradicting positioning according to the six respondents. It’s described as “simple” yet “overbearing,” “innovative” but “basic,” “expensive” yet “replaceable.” It seems as if consumers have a love/hate relationship with Apple, noting that though they are innovative and intuitive, their high cost and restrictive ecosystem prevent a perfect consumer experience. As for competitor brands, the results were somewhat flipped. 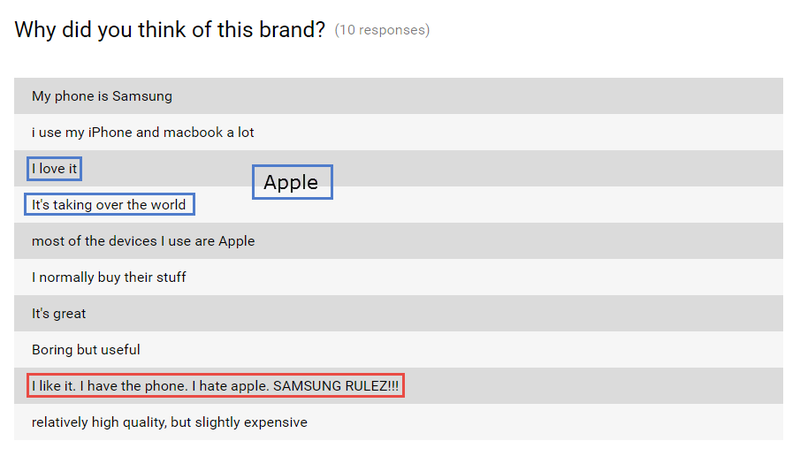 All four Samsung answers became Apple, and those that chose Apple switched to 3 Androids, 2 Samsungs, and a Microsoft. Three of the Apple (competitor) answers for the three descriptors were very negative, either attacking the brand’s business strategy and market position as “ruthless” or denouncing the products as overpriced, overrated, and deserving of a place in the trash. Samsung (competitor) answers differed with one calling it “alright” and the other saying “innovative” and “customized.” The three Android answers ranged from neutral to negative calling it “indie,” “clunky,” and “explosive,” a reference to the Samsung Galaxy Note 7. I didn’t expect the Microsoft answer though, which is most likely due to its 3rd place status in terms of mobile operating systems. These answers suggest that respondents mainly thought of mobile technology which is indicative of society’s and business markets’ shift towards a mobile emphasis. The love/hate relationship with Apple underscores Apple’s success in branding and marketing of its products despite its slower adoption of new technology compared to competitors. Due to brand loyalty and consistent brand messaging, Apple is able to not only remain in consumers’ consideration sets for phones and laptops, it dominates the competition in terms of brand recall. I will not go into much detail for the fashion responses but the main takeaways from the answers are that fast fashion brands like Forever 21, Zara, and H&M are prime in consumers’ minds as well as luxury, high-fashion brands such as Versace, Gucci, and Chanel. These brands were mentioned either because they are actually purchased by the respondent or have such strong branding that they have top-of-mind positioning despite not actually being bought by the respondent. For example, Gucci is described as “high fashion,” “cool,” and “expensive,” suggesting the user does not actually purchase the product (which I also can assume since the willingness to spend of all respondents is relatively low) but still recalls the product when primed with the word “fashion,” reinforcing the notion that Gucci has strong brand awareness. 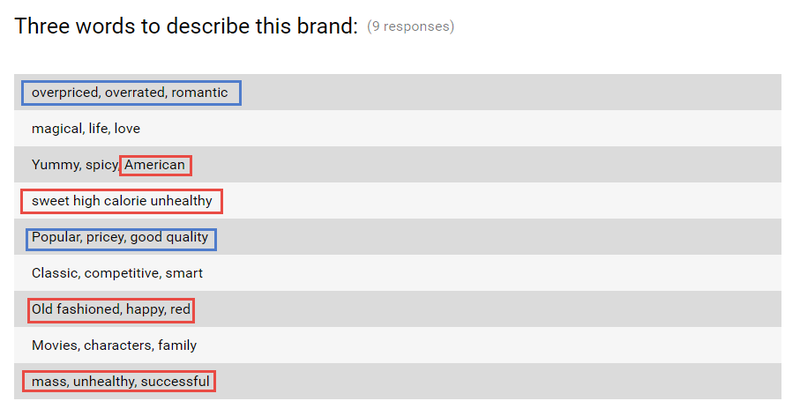 Lastly, the results for “happiness” met my expectations as well, with one surprise in the form of the answer “Calvin Klein.” That never occurred to me, but reasoning for the answer was even more surprising and amusing. I figured since a good portion of the respondents are also business students they would recall Coca Cola from its marketing campaigns centered on happiness, which manifests in quirky music videos, romantic commercials, and Share a Coke. 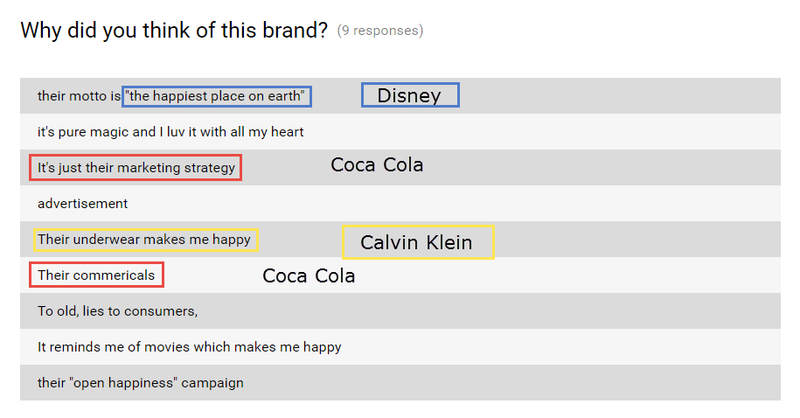 And since most respondents are from Southern California, Disney had to appear as well due to its “magical” branding and Disneyland slogan of “happiest place on earth.” Despite Coca Cola achieving top-of-mind positioning for “happiness” many descriptors are negative, suggesting that despite its clear marketing efforts to position Coke as happiness in a bottle, nothing can really take away the fact that soda and sugary drinks are unhealthy. However, it is viewed as an American classic, though with this group of respondents, that could be both beneficial or a deterrent in convincing them to purchase the drink. They’re a cynical bunch of people. Disney on the other hand successfully positions itself as a fun, magical entertainment provider despite being overpriced.